Ladies, just because we live in the Colorado Territory doesn’t mean we are not concerned with the fashions worn by our brethren in the States. 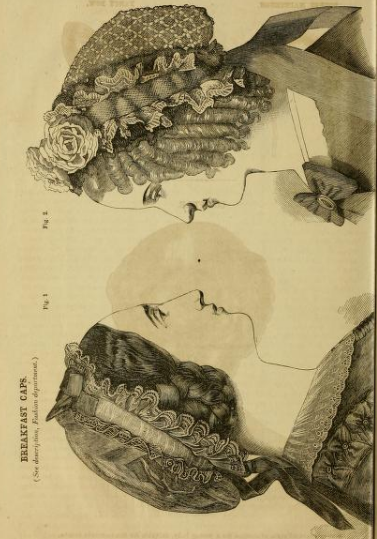 Those of us Lucky to receive this year’s volumes of Godey’s Lady’s Book and Magazine have seen the gorgeous shape of the Fancy Paletot and admired the beautiful lines of the Organdie Dress. For those less fortunate, we will Provide a summary of the latest fashions, from hats to boots and everything in between. We’ll start with this latest style which shows a dress of white grenadine with bouquets of gay flowers thrown over it. A fluted flounce of sea-green silk is on the edge of the skirt and the tablier and corsage trimmings are also of green silk. A white straw hat, trimmed with a black lace scarf and a bunch of wild flowers tops it off, literally. A hat is not only a vital fashion accessory, ladies, it is a requirement well-dressed women. 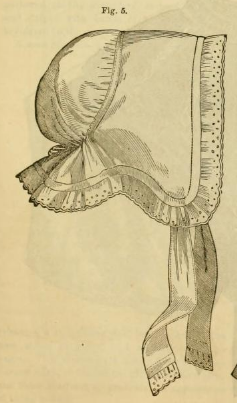 Godey’s Fashion editor states that a lady’s hat must correspond with her costume. She believes the most stylish hat this season is the whita felt, with a rather high crown and trimmed with a black lace scarf tied at the back.We’ll start with this latest style which shows a dress of white grenadine with bouquets of gay flowers thrown over it. A fluted flounce of sea-green silk is on the edge of the skirt and the tablier and corsage trimmings are also of green silk. A white straw hat, trimmed with a black lace scarf and a bunch of wild flowers tops it off, literally. The most important thing to remember about the hat is to wear the right one at the right time. For work, a bonnet trimmed with ribbons, lace, feathers, or flowers is adequate. In the early hours of the day, breakfast caps are stylish, but for an evening ball or afternoon tea, a stylish hat is a necessity. Presently, Eastern ladies prefer white organdy garden hats, but out west, the redesigned Hussar hat is popular. And don’t forget, at night, a simple but stylish night-cap will be appreciated by your husband. 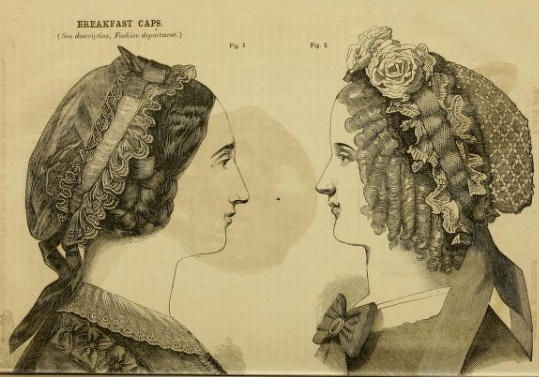 Stand by for the next issue where we’ll discuss the latest styles in hair coiffures. How the West was Worn: Bustles and Buckskins on the Wild Frontier, Chris Enss, 2006. 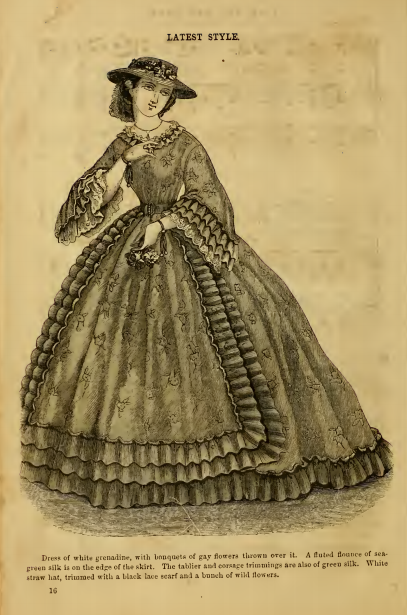 Clothing Images and descriptions from: Godey’s Lady’s Book and Magazine, Vol. LXVIL-From July to December, 1863, pp 9, 100. This entry was posted in 1863 and tagged 1863, clothing, fashion, Frontier, lady, style. Bookmark the permalink.